The good are always the target of malice and envy, slander and abuse from the wicked. Be assured that your goodness can be made tough enough to stand these ordeals. Avathars (or divine incarnations) too are not exempt from the attentions of these wicked forces. Krishna had to encounter these obstacles from the very cradle, right up to the finish of His life on earth. Personal spite, false slander, unfounded abuse and defamation followed Him at every step. Demons who could not tolerate the Light and the Love that He cast around Him conspired to tarnish His Name and obstruct His Mission. They tried to bind Him, to foil His plans and pervert His instruments. But Truth triumphed and falsehood stood exposed and disgraced. Truth may be clouded for some little time by the fog of slander but victory is certain. The forces of hate will be de­feated by their own wiles; they dig for their own downfall; their action results in reactions, ruinous for themselves. In the Court of Dhritarashtra (in the epic Mahabharata), the Kauravas (those who did not follow righteousness) planned to bind Krishna and put Him out of action when He went to His Court on the mis­sion of peace; but what happened? The stratagem recoiled on themselves and they were destroyed. 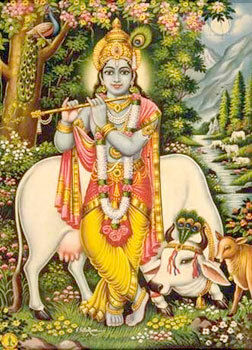 Krishna was unscathed by their wiles and their campaign of defamation. Krishna is undefeatable, ever pure, ever bright and ever effulgent in renown. Those who try to foil Him are forever tarred by their own blackness. The malignancy of those who cannot bear His Glory will cause their eternal disgrace; it cannot affect Him in the least. His Glory will increase a hundredfold with every challenge from these peddlers of slander. Wicked men tried to bring the Lord into disrepute by persecuting and torturing krishna’s devotees; but when they stood up to every challenge with joyful fortitude, they failed ignomin­iously. They gained vaster glory and the Lord’s Truth was magnificently vindicated. Persons who cannot tolerate the Glory of the Avathaar have indulged in such campaigns, in every Age! They have contributed to the heightening of the splendour and the spread of the message, in every age. Their activities are all instruments to the propagation of the glory throughout the world. Even today, such things happen; but all of you must recognise their inevitability and their fundamental falsehood, and carry on your spiritual practise in full faith and assurance, with undiminished enthusiasm and joy. The Sai Principle, the Sai Divinity can never be affected by any slander; it can never be shaken by any tactics; its progress can never be halted. Do not pay heed to the barkings you hear. A stray dog stops and looks at its own shadow in the stream; it mistakes the shadow for another dog and starts barking aloud. This sets all the dogs in the neighbourhood, and later in the region, bark in unison. The reason why the first dog barked is its own ignorance of fact. The reason why the other dogs followed suit is that the first dog called the tune. A huge scare is built on a patent falsehood. Thus the story goes on, adding one thing to another. Just as devotees remained unruffled in the Age of Krishna, you too must stand firm and be unaffected. Faith must endow you with courage and calmness. The life of Krishna teaches you this lesson more than others: do not lend your ears or mortgage your minds to purveyors of scandal. Krishna had to meet these malicious slanderers and destroy them one by one, throughout His life. His parents, His companions, His devotees - no one had peace from that tribe of Kauravas. The message is that you must see the Truth that is covered by all the tales and legends that tarnish the Name. Devotion to the Divine will give you bliss, and prosperity and peace. It cannot inflict pain, perturbation or personal anxi­ety. It fosters love and brings all together as one band of broth­ers. The Avathaar will not be affected in the least by these triv­ial tactics. It is love itself; so, it is always bliss, always happy in song and dance. 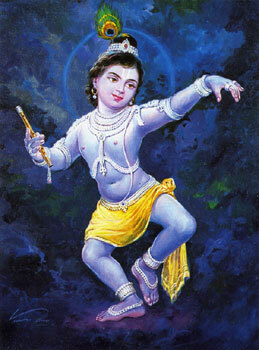 Krishna lived all His years singing and dancing in the ecstasy which was His very nature. He was humming a tune within Himself all the while, whether He was on a flower bed or a battlefield. I too am unaffected by praise or blame. My bliss (or Ananda) never suffers diminution. Where there is love, there is Ananda; where there is Ananda, there is music. That is the reason why Krishna sang the Bhagavad Gita (the Celestial song) while the clarion calls to start the battle were rising from the serried ranks. Love knows no fear, no untruth, no anxiety, no grief. I am love; I shower love; I share love; I am pleased with love; I bless that you have more and more of love to more and more Beings. Love is God, Love is Love—that is the message of Sri Krishna. 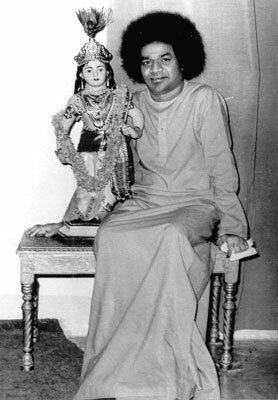 - Bhagawan Baba on Krishnastami Day, 10 Jun, 1974 .